In 1988, my new boyfriend, now my husband, invited me to his mother’s house Christmas day and his great aunt Frances Peters was among the guests. The family was exchanging gifts and she made sure that I had a gift to unwrap as well. She couldn’t have known that I was coming but must have had a gift ready for just such an occasion; pretty, flowered stationery, a much needed gift back then. That was my introduction to Aunt Frances. As my husband, Keith, and I were visiting this morning about his great Aunt Frances several memories poured from him. As a young boy he lived in the same neighborhood with his great aunt and would often stop to visit or see her riding her fat tire bicycle with a basket on it. He didn’t know what was in the basket but she always had a garden so he wondered if some vegetables may have been in it. When he stopped to visit, she would invite him in and fix lunch for him. He remembers that she did a lot of canning and he especially loved her dill pickled okra. He recalls visiting with her and sitting on her porch swing. That porch swing was a wedding gift to her from her grandfather Francis Garee. Several years ago we acquired the swing, Keith repaired and painted it the green he remembers it being. That handmade swing hangs on our porch at the lake as an inviting spot to sit, swing and visit. 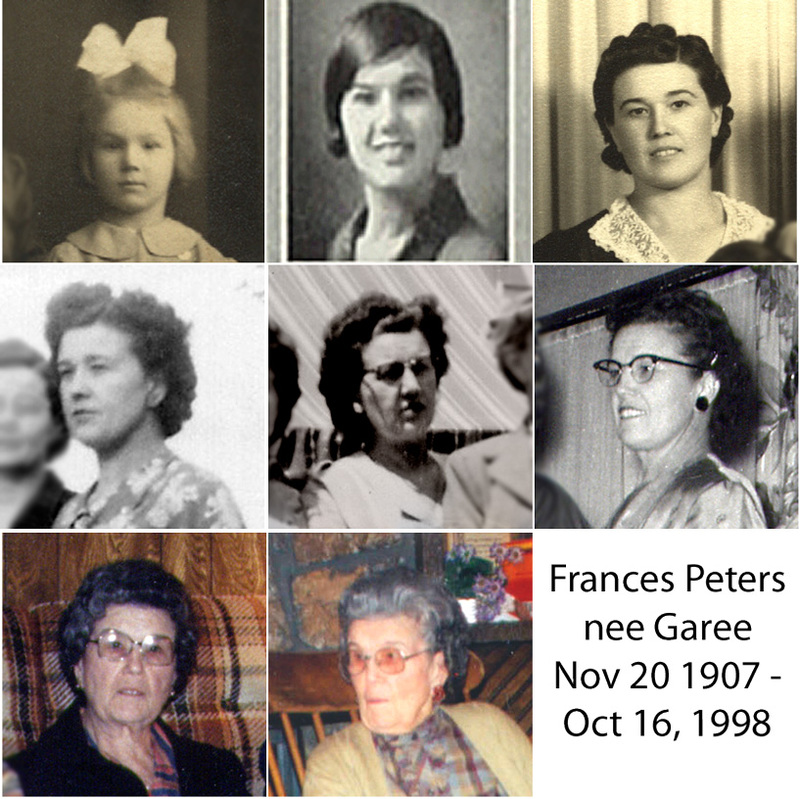 There aren’t many of the older relatives that our children had the opportunity to know but Aunt Frances was one of them. She was present for all 6 of their first Thanksgivings and Christmases and remember her fondly. Born in Noble, Oklahoma, Frances was the fourth of Ed & Eva Garee’s five daughters. She was proud to share that she was born four days after Oklahoma became a state, November 20, 1907. When asked how to spell her first name she said the female spelling is with an ‘e’ for hers and the male spelling has an ‘i’ for his. She was brown eyed, left-handed and told me that she had malaria as a child and as an adult. After high school Frances attended the University of Oklahoma in Norman and I believe she studied home economics; two of her sisters went on to complete advanced degrees there. One of the photos in the collage is from the 1926 OU yearbook. Not only did she attend OU but she and her sister, Elizabeth, were avid football fans attending every home & Texas game for many, many years going until they just couldn’t do it anymore. I recall reading a newspaper article, probably from the Norman Transcript, about how she attended the games no matter the weather for something like 50 years. I hope to find that article again. Aunt Frances and mother (Elizabeth) were both ardent OU fans. When Uncle Joe worked for OU he purchased 2 tickets for all home games on about the 30 yard line on the west side below the ramp opening to the seats. When Joe passed on she kept the seats and mother went with her as long as her health would allow. I got to go with Frances one time to a Nebraska game and the surrounding people were like family to her. The game day was like a military drill. We went early to the parking lot of the Noble arena so we could park close to the bus stop. We took our lunch, it was that early. A few steps to where the buses lined up, the buses had a limited route to the bus stop near the stadium. rest rooms before going to our seats. The seats were in the middle of the row so there was no one passing in front of us. Rest room at the half. She had disapproval of two men 2 or 3 rows in front of us because they sometimes drank too much. (Aunt Frances had a STRONG dislike for alcohol as was Grandmother Garee, a charter member of the Women Temperance Union in Noble.) But I digress. She stood up and cheered only when appropriate. We lost. Frances married Joe Peters on July 5, 1926 and told me that the minister forgot to sign their marriage license so a week later they brought it to his attention. He was quite embarrassed at his oversight but the Peter’s thought it was humorous. I didn’t know the porch swing had been hers – what a great way to sit and remember her. She was a delight and it was nice to have the reminder of her presence at those Thanksgivings and Christmases I was privileged to have with her. I love fried okra and okra that’s boiled in soups and such but I’ve never eaten any pickled okra. I’m not terribly fond of pickles in general but one day I’ll try pickled okra. Clearly, a lot of folks really like it.